Twix, the Mars chocolate bar, is packaged in pairs, due to its narrowness in comparison with other chocolate bars. TBWA London made the most of that pairing with “Pause More See More”, an advertising campaign centering on the “pause” symbol. Sitting in a park, eating a Twix slowly, gives you the chance to see life from a different perspective. 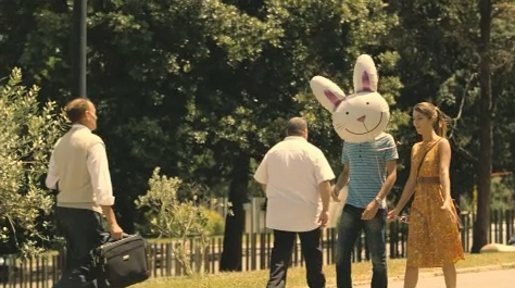 Look out for the guy with the bunny head, the guy with kids swinging into his mouth, the guy with joggers on his back…. The Pause More See More campaign was developed at TBWA, London by creatives Erik Tell and Marie Voss with agency producer Khirsty McCarter. Filming was shot by director Jeff Thomas via Sonny London with director of photography Ben Smithard and producer Alicia Bernard. Editor was Quin Williams at Marshall Street. Post production was done at Glassworks London.